We are so excited to announce our first featured artist. We had a lot of submissions and these guys really stood out to us as something different and refreshing in the music industry. PONCÉ is a dynamic pop rock duo based in Nashville, TN consisting of twin brothers Carson and Michael Poncé. 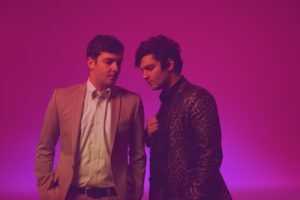 The twins efficiently cross genres; from classic, harmony-driven melodies reminiscent of Tom Petty And The Heartbreakers, to modern, synth-led pop productions with melodic guitar leads evocative of The Killers and HAIM. The brothers grew up in a musical household, both taking the required one-year of piano lessons taught by their mother before she would get Carson his much desired Ibanez electric guitar or Michael’s long sought-after Percussion Plus drum set. The twin’s debut EP ‘Afterglow’ was recorded at The Sound Emporium and produced by friend and fellow Nashville rocker, Marcus Garceau of Omega Swan. The album was largely written during the course of touring while opening up for the alternative folk / indie pop band PHOX in 2015. Check out PONCÉ on our playlists and their spotify channel. Also, make sure you pick up Afterglow on their website!